These Woven Key Rings are a great craft for Camp activity for both boys and girls. The lesson in weaving will stay with them for other projects. Cut two 54". pieces of flat cord. Pull them through a key ring to the center of the cord. Cross the cords holding them perpendicular to each other. (fig. A). 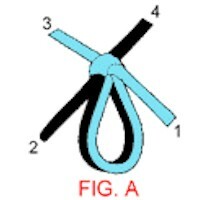 Fold strand 1 to opposite side leaving a small loop; (fig. B). 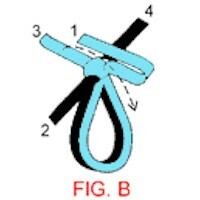 Fold strand 3 to opposite side leaving a small loop. Hold strands in place with one hand. With your other hand, weave strand 2 over strand 3 and under strand 1. 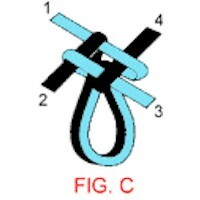 Weave strand 4 over strand 1 and under strand 3; (fig. C) Pull tightly. Continue until you have about 4" braid. Tie off securely and trim.